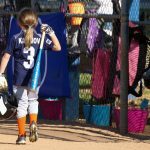 My five-year-old daughter has thoroughly enjoyed her first softball season. She likes every aspect of it, including the anticipation of the snack after the game. That is BIG motivation for the 6 and under softball team. But one Saturday morning she seemed a little less into the game. It happens. She’d already had a long week of school and had a game the night before. When the 2nd inning ended, she asked me “are we done yet?” I told her she would have one more at-bat. She kind of rolled her eyes. This game was early in her first season and she hadn’t made good contact with the ball quite yet. She was getting close, but she was tired and looking forward to the next activity, the snack. For a little kid, that’s a totally understandable distraction. We could have gone home and had a great weekend no matter how she played that morning. But she played one more inning. She had by far her best hit of the season. I was thrilled for her. She was happy. And she got a special snack, a hot dog from the hot dog stand. In business, You may be tired. You may be thinking you’re done and ready to call it quits. But try once more. You never know. You may get that hit. That coveted snack. And maybe even a hot dog!